Are you among the 1 in 10 women who struggle to get pregnant or the 1 in 12 who are infertile? Experts estimate that the recession-led baby bust is now over and more babies will be born this year and next year than in previous years. Still, a significant number of couples struggle to get pregnant during their prime childbearing years. Share your baby-making plans with your healthcare provider to first rule out any health issues that may prevent conception, and then ask based on you and your partner’s ages and health what a reasonable time for trying to conceive (aka TTC) is before you check back in for further counseling. With more smart technologies than ever before, and a focus on preconception health more prominent, you’ve got help in conceiving from more than just your healthcare provider. From new medications to induce or enhance ovulation, surgical options, and artificial reproductive technologies (ART), these new options also have increased success rates. Where to begin? If you’ve just started TTC, check out apps for smart phones that will help you determine if and when you’re ovulating. Popular options include Ovulation Calendar, Fertility and Ovulation Tracker, Fertility Friend, OvuView and Baby maker Fertility. 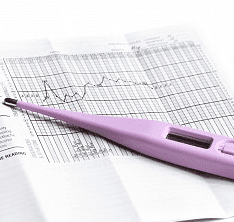 Tracking your body’s resting temperature-your basal body temperature-will help you sleuth out that spike that signals your fertile period of your cycle. New digital basal body thermometers will measure to 1/100th of a degree. New ovulation detectors also test your urine, include vaginal sensors, and microscopes to analyze your saliva. These include iBasal Digital Thermometer, the OvaCue Fertility Monitor and the Fertile Focus Ovulation Microscope. Another fertility monitor is the Fertility Watch, which is a wristwatch designed to measure the fluctuation in specific salts in your sweat. This device works on the discovery that chloride levels in sweat increase approximately 5 days prior to ovulation. If you’re considering the costlier options of assisted reproductive technologies, including in vitro fertilization, IVFpredict.com leads you and your partner through a series of questions and then uses a mathematical equation to predict your chances of achieving pregnancy and birth from an IVF cycle. And it’s a little easier on the pocketbook: this website is free and there’s and iPhone app version too.